This desk and hutch combination gives you plenty of storage and work space. 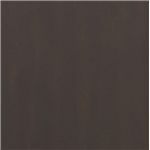 A beautiful two-tone look is created by the wirebrushed oak veneer top and the desk's rich finish. 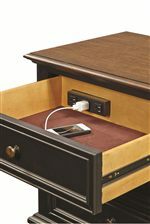 The desk includes a file drawer for letter or legal size files, while the corner hutch has one drawer and three mail accessory slots. 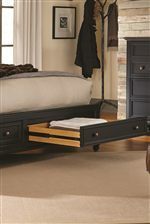 The hutch boasts a lift-up top that holds cords and chargers, and the center area fits most laptops. Enjoy the ergonomically curved edge that lets you cozy up to the desk and have space to move around. It's finished on all sides, giving the desk a polished and professional look. Let this curved, half pedestal L-shaped desk bring style and function into your home office. 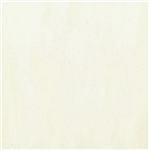 Available in either black or white linen finish. 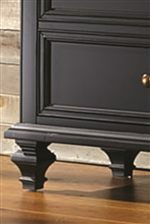 The Ravenwood Curved Half Pedestal L-Shaped Desk and Corner Hutch with 1 Drawer by Aspenhome at AHFA in the area. Product availability may vary. Contact us for the most current availability on this product. 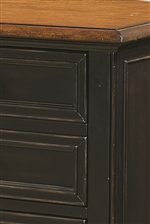 I65-372 L-Shaped Desk 1 72" 48" 31"
I65-370CH Corner Hutch with 1 Drawer and 3 Accessory Slots 1 40" 40" 6"